We sell to many specialist dental, medical and general distributors in UK, supplying the domestic and global markets and featuring in their catalogues and web sites. Substantial wholesale discounts are available depending on the number of items ordered. We also offer a free customisation service in which the instruction sheets and outer labels can be customised using your logo and address, so that customers return to you for replenishment packs and further orders. Our minimum order quantities for these customised products are deliberately small to help you start listing our products. We will also supply you with high-res images and text for your catalogue or web site. If you are interested in adding our products to your listings, then please contact us. Scoops x 10 Pack of 10 scoops for replenishment or replacement in larger numbers of hospital type mercury spillage kits, usually in the hospital or industry setting. The scoops are included as they allow quick and efficient mercury handling after a spillage. .. Many teeth extracted in the dental clinic have metal restorations which can be recycled for profit. 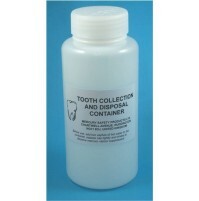 This container is designed for safe storage and disposal of extracted teeth, being shatterproof, leakproof and including a mercury vapour suppressant. ..